PRAGUE, Czech Republic -- For the first time in more than two centuries, Ukraine sees its way to independence from Moscow. The city skyline is seen from Independence Square in Kiev, Ukraine. The country has the potential to triple its domestic production to 60 billion cubic meters a year by 2030 with the help of international oil companies. That path tracks through a patch of sealed Soviet-era natural gas wells that are ready to be tapped once again and fields of shale rocks that the U.S. Geological Survey estimates will hold enough gas to fire eastern Europe’s largest nation for 100 years or more. Royal Dutch Shell Plc, Exxon Mobil Corp., and Chevron Corp. -- three of the world’s four largest oil companies -- bid last week for Ukrainian exploration rights. “Ukraine is low-hanging fruit,” said Bertrand des Pallieres, chief executive officer of London-based Cadogan Petroleum Plc, a London-based oil explorer with interests in 14 Ukrainian fields. 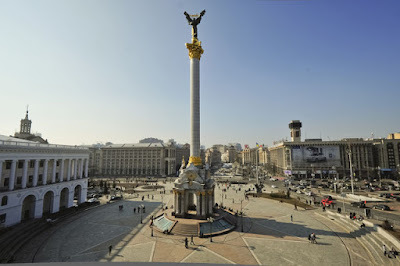 “Ukraine has well-known basins that have been totally undermanaged and underinvested,” he said. The same technology that unlocked natural gas from shale rocks and made the U.S. the world’s largest natural gas producer is being rolled out across eastern Europe, home to the continent’s most promising prospects. If drilling succeeds, Ukraine will be able to lessen its reliance on Russian export monopoly OAO Gazprom for its natural gas supply, ending the economy’s vulnerability to decisions taken in the Kremlin. The country, part of the Russian empire from the 18th century and then a Soviet republic until 1991, also has thousands of conventional natural gas wells, many of which were sealed and abandoned in the 1970s when the Soviet state decided to move production to Siberia. Ukraine plans to auction the rights to as much as 70 percent of production at the Oleska field in the western part of the country and the Yuzivska field in the east by May 23. The areas contain both shale and conventional gas deposits, and the bidders, which also included Eni SpA and TNK-BP, each paid between $1.3 million and $1.9 million to apply for the license, according to the government. The state also plans to sell two licenses for gas exploration in the Black Sea and another one inland in the coming weeks. “Thanks to all the historical activity there is a lot of available data, as opposed to wildcat exploration,” des Pallieres said in a telephone interview. The country has the potential to triple its domestic production to 60 billion cubic meters a year by 2030 with the help of international oil companies, he said. That would bring it up to the level last seen in the 1960s, when it supplied one third of the Soviet Union’s gas needs, and end its dependence on Russia. Ukraine is eager to loosen Gazprom’s grip on its economy. NAK Naftogaz Ukrainy, the state monopoly, bought 45 billion cubic meters of natural gas from Russia last year, paying $13.9 billion, or 8.4 percent of Ukraine’s gross domestic product, Deputy Finance Minister Anatilyi Myarkovskyi said on March 16. The country wants to cut the price to $250 per 1,000 cubic meters from the $416 it paid in the first quarter to trim the budget deficit, which reached 4.3 percent of GDP in 2011. Russia has so far refused to lower the price unless Ukraine surrenders control over its pipelines, which have carried as much as 80 percent of gas moving from Siberia westwards to the European Union. Gazprom has twice in the past six years cut natural gas deliveries to Ukraine on New Year’s Day because of pricing disputes. In a further setback, Russia began rerouting some supplies to Europe through the Nord Stream pipeline in the Baltic Sea and another across Belarus. To triple its domestic production to Soviet-era levels, Ukraine needs to invest as much as $10 billion a year in the coming decade, des Pallieres has estimated. That will not be possible without the participation of foreign companies because Naftogaz is so cash-starved it can barely maintain the current production levels, said Vitaliy Radchenko, an energy researcher at CMS Cameron McKenna in Kiev. “The state companies are almost bankrupt because the state limits how much they can get for the gas they produce,” he said. Naftogaz reported a loss of 20.6 billion hryvnia ($2.6 billion) last year, the Finance Ministry said. President Viktor Yanukovych is unlikely to raise household gas prices before the end of the year as his party faces parliamentary elections in October. 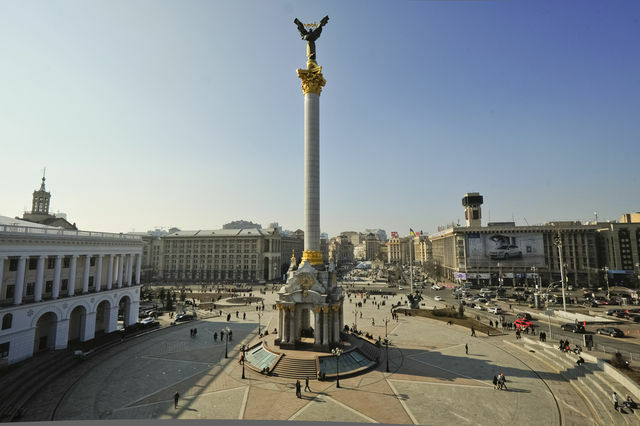 Up to now most foreign investors have been cautious in embracing Ukraine. The country’s unstable political climate, excessive red tape and high corruption levels have kept foreign business away, Radchenko said. Recent setbacks in shale-gas exploration in neighboring Poland have also raised questions about the region’s potential. The Polish government said last month shale-gas reserves may be lower than previously estimated and drilling a well costs almost three times as much as in the U.S. Still, Ukraine’s gas reserves are “enormous” and the government has made considerable progress in improving the investor climate, said Ulrich Benterbusch, the director of Global Energy Dialogue at the International Energy Agency who is drawing a list of energy policy recommendations for the Ukrainian government. “For years key policy makers in Ukraine were betting on the fact that somehow they would get the cheap Russian gas,” he said.